Can you tell that I am back!?!?! I know it's been a little quiet on my blog, but things are coming around. Still trying to learn this new system too!! The other day it took me 30 mins to find where I had even saved a file. Couldn't find the desktop button, oh it was hilarious...Now I feel like my age is catching up to me or I need to really catch up to the times!! Either way, pretty scary!! So today, I wanted to share a card I made using one of the images from, From The Heart. Don't forget that you still have plenty of time to join 1 of 2 challenges or why not do BOTH!! LOVE it, Nazeema !! I totally like the earthy colors and how you´ve added the sentiment behind the image. Very, very pretty. Super coloring job! I also like the tilted panels and the rustic twine. Thanks for sharing your card with us at Cards in Envy! gorgeous!!! amazing image and coloring!!! thanks sooo much for playing with Cards in Envy!!! Love the angles you gave the card. Such a cute pumpkin. Thanks for playing Cards in Envy!!!! 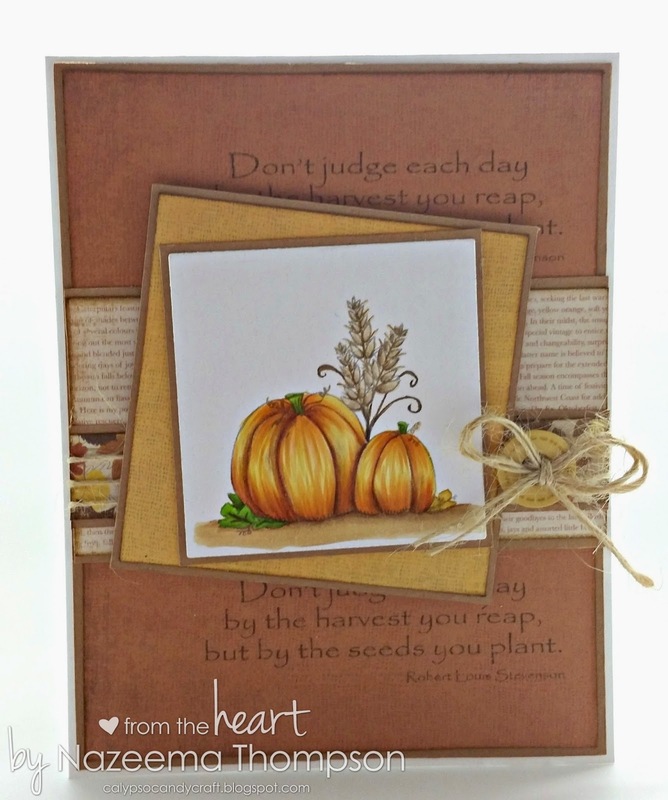 Love the pumpkin image you used and the colors! So pretty! Thank you for sharing with us at Cards in Envy!